It took a long time for me to understand that just because a recipe is simple, doesn’t mean it can’t be spectacular. This mantra has completely changed the way I cook - both for regular weeknight meals and entertaining guests. By focusing on simple, seasonal ingredients - even if that just means growing a pot of rosemary on the kitchen windowsill you can add a huge amount of oomph to very undemanding recipes. Then add in a little visual flair and simple ingredients have been transformed into much more than just the sum of the parts. 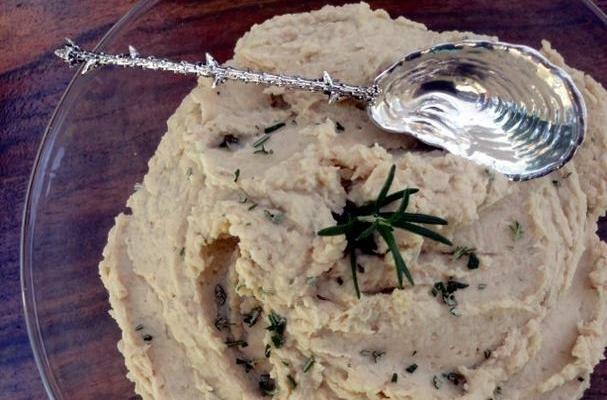 This cannellini bean and rosemary brandade is simplicity itself to make. Present it in a nice bowl, add some chopped rosemary and a little sprig for garnish, serve with a beautiful spoon and simple is transformed. The silver spoon in the photo is actually ‘meant’ to be used for sugar, but I view the names of silver pieces as suggestions rather than life sentences. Nancy Stuckwisch of Silver Magpies has had a life-long fascination with vintage silver. She loves to cook and entertain and believes we should get the silverware out of the cupboard, onto the table, and then into the dishwasher. She writes for her own blog and is a regular columnist for Silver Magazine. My daughter has food allergies and can't eat hummus. We are always looking for a good "dip" alternative, and this recipe looks delicious! And I agree, simple recipes are perfect because of their simplicity! Hello Susie - I'm glad to add to your repertoire of dips! As I said in response to a comment above you can play on lots of variations on this theme. Different types of beans, oils, and herbs....essentially an endless combination...just pick flavors you like. Talk about an easy dip! Always into getting another unusual dip to entertain with. Hi Shelly - Yes it is super simple! Great variations can be made by using different oils...like the tomato flavored oil from a jar of sun-dried tomatoes. Yum! Hi Laurie - It can be a dip for veggies, or a spread on a sandwich. I like to spoon some on a lettuce leaf and the roll it up to eat as a wrap. Meanwhile, I'll submit the ultimate vote of approval - I'll add a shortcut to Foodista so I can quickly return. Thank you Elainne. I'm very flattered you have added a shortcut! I like the fancy name of this recipe. It sounds like it's got 25 ingredients and takes 3 days to make. Impressive! Hi Claire - Name and presentation can add a lot to the total package...but of course the recipe still has to be good!